I am always a bit at a loss when people ask me about myself. I often say that I had the great good fortune of having been able to do what I liked most. This is still true now that I am retired. I am Emeritus Professor of Cognitive Development at UCL. From 1998 to 2008 I headed a research group and was Deputy Director of the Institute of Cognitive Neuroscience. Before this I was a researcher at two centres affiliated to UCL: first, 1968-1982, at the MRC Developmental Psychology Unit, founded by Neil O’Connor; then at its transformation into the MRC Cognitive Development Unit (1982-1998) under John Morton’s directorship. I was Visiting Professor at the University of Aarhus at the Interacting Minds Centre from 2007 to 2015. What did I do in the past? My research was funded in 5-year cycles by the Medical Research Council, for which I am deeply grateful. You can look up my publications in various places. I point to them because they define my work, but it is also defined by my outstanding mentors, colleagues and students. In 2008 my friends produced a Festschrift with the title A neuro-cognitive approach to developmental disorders. My two favourite disorders are autism and dyslexia, because they are endlessly fascinating and also because they give glimpses of the hidden machinery of the mind. My work has mainly consisted in doing experiments using methods from experimental psychology. These allowed me to investigate daring hypotheses about some impossibly complex high-level cognitive processes, such as “Theory of Mind”, “Drive for Central Coherence”, and “Phonological awareness”. This work guided me towards explanations of some of the most puzzling features of autism and dyslexia. My ambition was to discover the nexus of the underlying cognitive causes of the symptoms of these disorders. I tried to link them to behaviour on the one hand and to the brain on the other. The enterprise was partially successful in that some ideas and findings stood the test of time, and some did not. I tried to make my research relevant to understanding some of the daily struggles of individuals with developmental disorders and their families. It is very doubtful whether I got anywhere near these lofty goals. I have also been interested in making developmental neuroscience relevant to education and learning. With Sarah-Jayne Blakemore I wrote a book “The learning brain, Lessons for education“, published 2005. In 2010-11 I chaired a Working Group for the Royal Society in their series Brainwaves: Neuroscience, Society and Policy. We produced a report entitled “Neuroscience: implications for education and lifelong learning“. What am I doing now? Retirement liberated me to take up some new interests, in particular the promotion of women in science. I have been chair of the Royal Society’s Diversity Committee since 2015. I am very involved in various projects that aim to widen the talent pool and to remove still existing barriers to science careers. I am reviewing studies on facts and fallacies about diversity in science, and am particularly interested in research that investigates how groups can make better decisions than individuals, It turns out that diversity is key to this. I wrote a brief guide on Unconscious bias which you can download from the Royal Society’s website. You can also see an accompanying 3-minute animation on YouTube. I have long been interested in science communication and enjoy trying out different media and even venturing into topics beyond my expertise. In 2014 I presented a BBC2 Horizon programme “Living with autism”. This gave me a taste for being more active in documentaries. In 2015 and 2017 I presented two other BBC2 Horizon documentaries, one on OCD “A monster in my mind”; and one on “What makes a psychopath”. You may be able to catch these programmes on i-player or YouTube. I am also occasionally taking part in BBC Radio programmes or podcasts on science themes. From 2017 – 2018 I was President of the British Science Association. Its mission is to put science at the heart of culture, and this entirely coincides with my own aspirations. What will I be doing? I relish the freedom to do many different things, not necessarily connected with my previous life. Still, I am as fascinated as ever by research on autism and on dyslexia and try to keep up with research as it appears, often via Twitter. 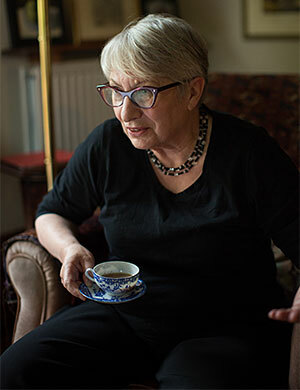 I also like to alert others to papers that I find interesting by tweeting about them via @utafrith. My ever growing interest is in understanding the social mind. Of course the impetus originally came from my studies on autism. To understand the nature of this condition it is necessary to ask questions about the cognitive mechanisms that enable everyday social communication. There are still many open questions because it is such a complex field. Can we find out what is uniquely human about our social nature or will it remain a tantalising mystery? What makes us selfish – what prosocial? What makes us tribal? How can we achieve harmony? These are the sorts of things that I am constantly discussing with Chris Frith. We are trying to collect our thoughts in a book entitled “What makes us social”. We want to draw together what is known about evolution, development and pathology of social cognition. But we are also working towards a graphic novel with the same content. Our son, Alex Frith is supervising this project as author and director; Daniel Locke is the artist.